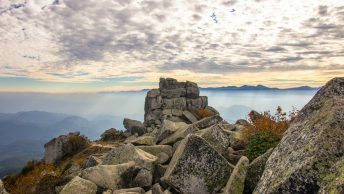 While Golden Week in Japan tends to correspond with some of year’s best weather the downside of course is battling it out with an inordinate number of climbers. Having said that this hike includes plenty of remote and secluded trails allowing for a true wilderness experience. Getting to the trail head is lengthy enterprise taking 6.5 hours from where I live in western Tokyo. On weekends and public holidays there are two daily bus services from Enzan Station to Ochiai 落合 the closest transport link. The morning bus departs at 08:30 outside the south exit and not surprisingly there was a large contingent of hikers lined up though mercifully, most were headed to the Nishizawa Gorge. By the time the cramped hour bus ride was up only four of us disembarked at Ochiai as most hikers shrewdly park nearby the trail head. From the bus stop continue walking 100 metres turning left at a road which follows the Takahashigawa River. After 25 minutes turn right past a small shrine which heads up to a gate near the Atarashi Inugiritoge 新犬切峠. Following this road takes you to the Sakuba Hirahashi 作場平橋 car park with restroom facilities. From here thankfully it’s only another 45 minutes of dreary road side walking to the trail head. The trail up to the Shougen Yamagoya 将監小屋 is easy-going following a vehicular access route. Total walking time from the trail head should take a little over 2 hours with a couple of small watering holes available to fill up if needed. 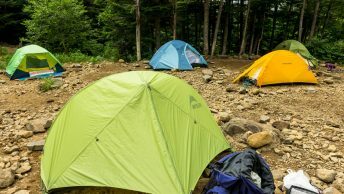 What I wasn’t prepared for was the number hikers who had already made camp by the early afternoon. Best advice is to select a spot on one of the embankment edges to avoid being hemmed in and to provide a little space to manoeuvre while cooking. The evening was greeted with a full moon and remarkably for this time of year the temperature barely dipped below 10 degrees overnight. Most folk had eaten breakfast and packed up well before I exited the tent at a more leisurely 06:00am, largely I suspect to secure a site at the next campsite. From the Shougen Yamagoya it’s worth wandering up to the Shougen Toge which along with providing a bird’s-eye view over the hut also has a nice outlook towards Rino Toge リンの峰. 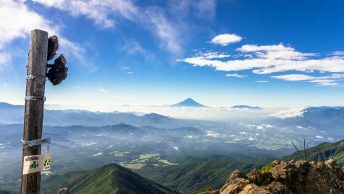 The trail from the Shougen Toge across to Hageiwa Rock 禿岩 is easily the most picturesque with occasional clear vistas towards Mount Fuji and the Minami Alps. The rock outcrop itself provides a wonderful view over the Chichibu Tama Kai National Park. Just below the rock crop finds a prominent trail junction with an option of taking a short detour up to Mt. Obora 大洞山 (2,069 m). The next section down to the Sanjounoyu Yamagoya 三条の湯 looked all fine and dandy when I planned out the hike but in reality was far from it. The first sign I thought something was amiss was passing a lone climber sporting a helmet, his face was solemn, even grim. A little further along I realized why. The trail between the two watering holes leaves little margin for error with some sections no more than a foot wide, with its edges skating into an inextricable abyss below. According to the staff at the Yamagoya during the spring the south-easterly ridges become dry, erode and hence become somewhat unstable. Having passed this far there was no chance of turning back and could only hope things would improve, which they did but only slightly. Arriving at the campsite feeling exhausted and mentally spent I quickly spied a nice spot, set up the tent and prepared for an afternoon relaxing by the river. The campsite filled to overcapacity with 70 odd tents miserably cramped into the 20 designated spaces, though the quiet hum of the river muted any extraneous noise. From the Sanjounoyu Yamagoya the trail lives a high and mighty existence as it shadows alongside the Ushiroyama River. While the trail is narrow it makes a pleasant contrast to the previous day’s angst and takes around 30 minutes to reach the Ushiroyama Road. This graded forestry road shifts between concrete and gravel with few nice areas to rest until reaching the main gate. I seemed to make good headway and found myself resting on a grassy road embankment above the Omatsuri Bus Stop a good 90 minutes before the next bus back to Okutama Station. Day Two is challenging, frightening and exhilarating! Well done and thanks for writing so effectively about each of your adventures. Very kind you to say so Brenda. The second day was certainly action packed and once the first gnarly section of trail was passed there was no turning back. Never felt so relieved to arrive at a campsite. Two questions (that may not be relevant to this area but I would think are factors for hiking in Japan in general). First, what is the correct method for dealing with boars on the trail? Obviously when first sighted you should back away slowly not making any sudden movements but if they approach/attack should you a) play dead b) fight back c) run like mad (is it possible to outrun them?). Also in general are they pretty aggressive/protective of their territory or are they afraid of humans and will take any chance to leave the area? Secondly, I have come across the infamous Japanese Giant Hornet on a few of my more recent adventures. They don’t appear to be overly aggressive. However, according to wikipedia they are the deadliest animal in Japan. Have you had any run ins with them on the trail and if so what is your course of action? Anecdotally from what I have read attacks from Japanese boar or inoshishi seem to be on the rise though most have occurred in the mountains around Kobe. Personally I have never come across any in the Kanto area though there are apparently many. While wild boars have poor eyesight they do have an excellent sense of smell so if you come across one they will likely sus you out pretty quickly. Generally inoshishi don’t attack from distance to your best defence is to not corner them, keep your distance and stay calm. If you do find yourself being charged best advice is climb the nearest tree or boulder or failing that sidestep it very quickly. The Japanese Giant Hornet is a different kettle of fish as these pesky blighters are ubiquitous throughout the year except winter time. Your right they aren’t particularly aggressive though tend to be most active in the autumn. Each time I come across some I do my best to skate around them, backtrack a little if needed and leave them alone as much as possible which seems to do the trick. A good idea is to keep to the trail as if you do happen to disturb a nest in the brush they will attack. Just last Sunday I went to this mountain – Obora from Tabayama michi-no-eki , but missed going to Hageiwa which was so close at one point. Anyway views were equally good at a few points and at Maehiryu. 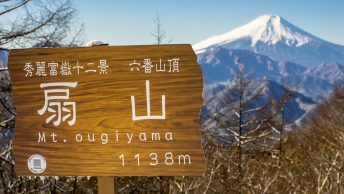 Dont know why they have two names – Yamanashi people call it Hiryu ! By the way can you check elevation change ? For me it was atleast 1500meters. You did well hiking Mt. Obora as a day trip as from Tabayama it’s a long way. I recall the view from Hageiwa Rock was pretty awesome and would’ve been even better in the winter. I’ve updated the elevation change. The first time I calculated it was from the Ochiai bus stop.